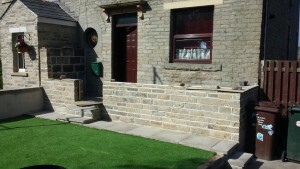 In July of this Year, Alpine Glass completed a bespoke home improvement project for Mr Smith and his home in Leeds. It involved installing a glass roofed porch that incorporated a composite solidor. The overall finish of the job is fantastic. Alpine Glass have made this job so easy to live round. From customer services to installation, everything was first class. The triple glazing glass reduced noise from nearby factory. We have more family living space and something our neighbours envy. Thank you “Alpine Gang”- a job well done! Mr Smith was so impressed with Alpine Glass, that he wanted them to install a new porch and door – a big change to the front outlook of his home. He wanted to improve the noise and thermal insulation of his home’s entrance, whilst also maximising on the amount of living space. 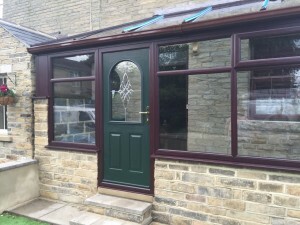 The porch and composite door from Alpine Glass were the perfect solutions! After Mr Smith used the composite door builder and received an initial quote, the Alpine team visited Mr Smith to discuss styles, colours and accessories. Mr Smith wanted the new porch and door to match the existing style of his property, including the light coloured brick work and uPVC frames with a dark wood-effect finish. Pleased with Alpine Glass’ products and expert advice, Mr Smith was happy for the installation to take place as soon as possible. The professional team worked hard to install new brick work, a uPVC framed porch with efficient glazing and imitation dark wooden frames and a brand new composite solidor with detailed glazing and golden-finished accessories. The new porch and door match the existing front entrance perfectly, thanks to the carefully managed building work carried out. Equally, the high-performance composite door from Solidor has improved the general outlook of Mr Smith’s home, as well as increased security and noise insulation (thanks to the state of the art triple glazing used). The Solidor combines uPVC and timber, and is therefore far stronger and more durable than doors that only utilise one material. The new porch uses efficient glazing which helps to retain heat inside, making the porch a new living space that can be used all year round without getting cold! Thanks to the expert fitting, it will also remove worries of vital heat escaping – helping Mr Smith to waste money spent on heating. Mr Smith rated Alpine Glass full marks for every aspect of the project – ranging from customer service to product quality and the amount of product information he received. 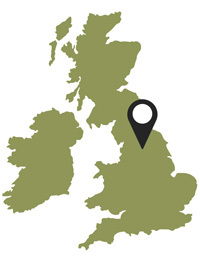 Alpine Glass, home improvement specialists based in Bradford, have been offering fantastic window, door and conservatory solutions for homeowners across the UK for a decade. It is this knowledge and experience that is reflected in case studies such as Mr Smith’s. In addition to high performance composite doors from Solidor and thermally efficient porches, Alpine Glass can update or replace your windows and conservatories – or create home improvements tailor-made to your home. So if you want to be left as happy as Mr Smith, don’t hesitate to explore our product pages or visit our showroom.